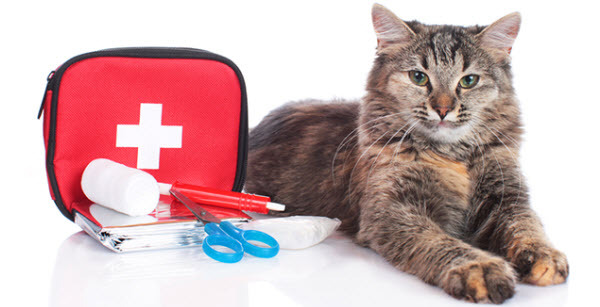 As pet parents, it’s our job to know what to do in an emergency. Are you prepared? This month ASPCA is helping us to get prepared, with tips and information for disaster preparedness month. 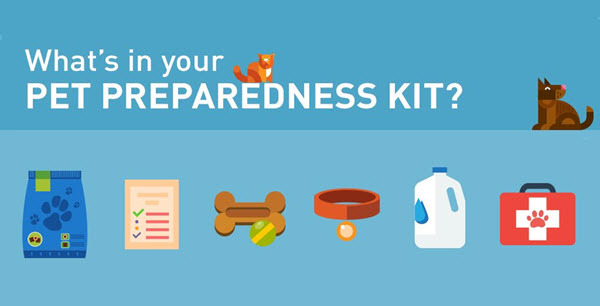 None of us likes to think about bad things happening, but it’s important to take the time now to make certain that you and your furry family members have everything you need in case of a life-threatening emergency. One of the best ways to do this is to create a disaster prep safety kit with all of the necessary supplies should any type of disaster affect your community. 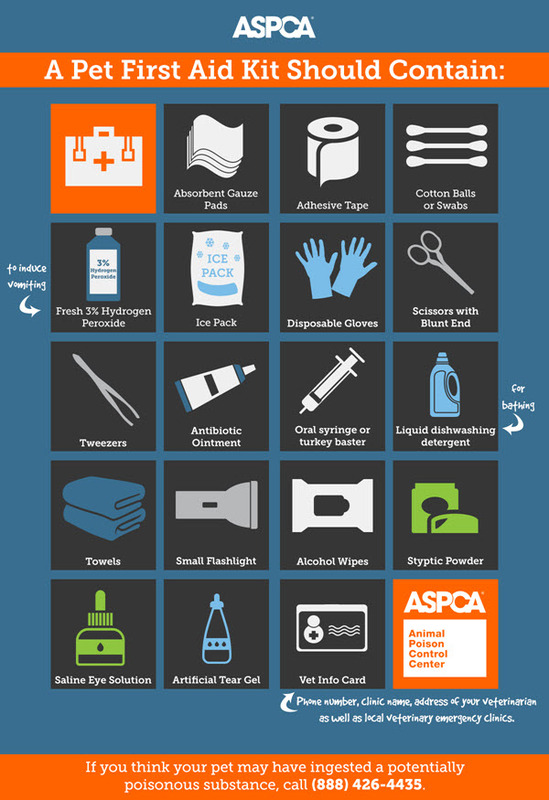 To help you create your home’s emergency kit and keep your pets safe, the ASPCA has provided an excellent checklist of items. 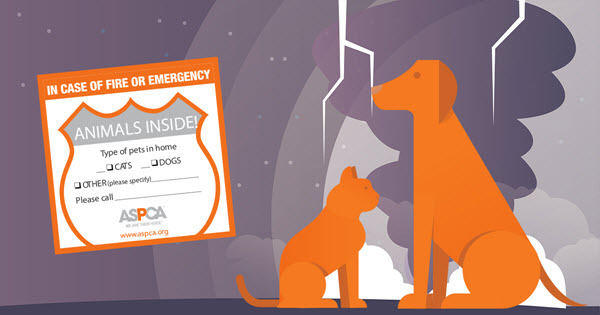 In addition to creating a pet emergency first aid kit, you can also TAKE THE DISASTER PLEDGE and receive a free window sticker that alerts rescue personnel that you have a pet at home. Want to learn even more about preparing your home, family and pets for an emergency or natural disaster? Visit ready.gov/animals for tips on Pet and Emergency Planning. First came Black Friday, and then was Cyber Monday…and today is Giving Tuesday — a chance to give back to a cause you care about. We know that as pet lovers, you feel as strongly as we do about helping animals in need and this year ASPCA has teamed with Crowdrise, one of the largest fundraising platforms on the Internet, to celebrate Giving Tuesday. When you make a donation HERE, you’ll be supporting the important work of the ASPCA AND help build the Crowdrise Giving Tower, a large virtual tower built by donation “bricks” from generous people like you. 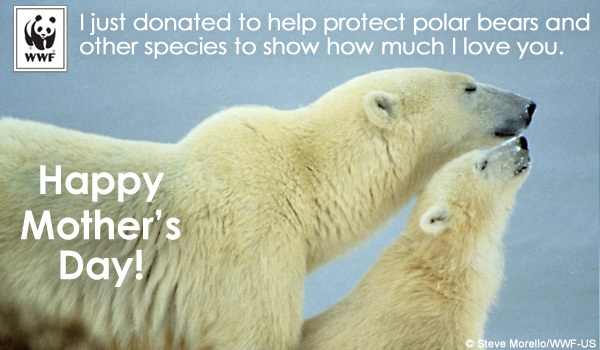 You’ll be able to see the impact your donation is making in real time! Not only is today CAT-urday, but this whole month is also Adopt A Shelter Cat Month! If you think you might be interested in adopting a homeless cat, be sure to check out the American Humane Association’s Top Ten Checklist for Adopting a Cat. There’s a fun and easy FREE way to help feed a hungry shelter cat. It’s Meow Trivia over at Free Kibble Kat. Just answer a new question each day and right or wrong, you win! 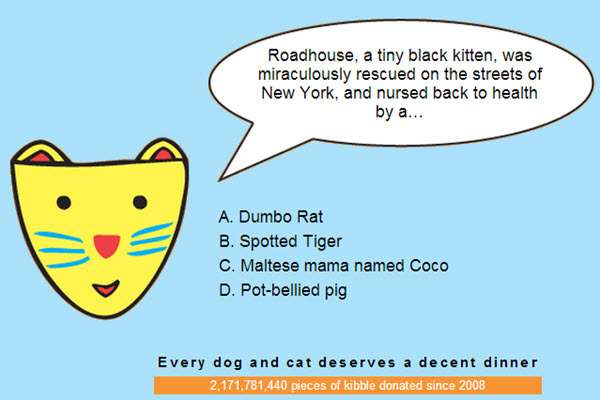 Click on an answer, and every day you do, your answer will earn 10 pieces of kibble to Animal Shelters to help feed their hungry cats. Play Meow Trivia every day – the more you play, the more kibble for the cats! This week is the 99th edition of ‪‎Be Kind to Animals‬ Week and you can join the celebration and help by taking the pledge to stand up for all animals today! 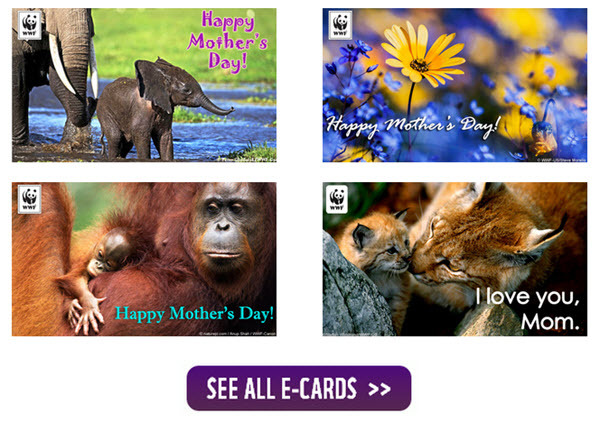 After you take the pledge, you can also share one of several cute images to help spread the word. 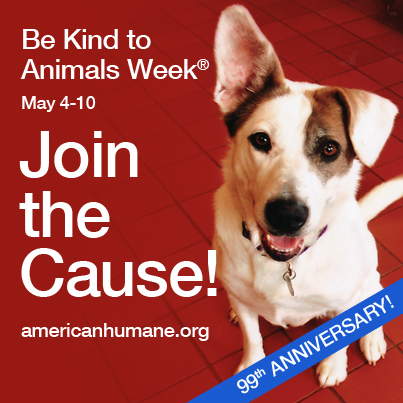 Visit www.americanhumane.org/bekind to take the pledge and help spread the word about the importance of being kind to animals this week and EVERY week! Every year, an estimated 3.7 million animals must be euthanized at our nation’s shelters because they could not be adopted into loving homes. Help animals find a second chance at happiness by adopting your next pet from your local shelter or rescue group. American Humane Association has pet adoption tips to find the animal companion that’s right for you and develop a bond that will last a lifetime. Pets are like children who never grow up. They need you to help keep them healthy and safe throughout their lives. Keep your animal’s vaccinations up-to-date. Make sure he’s wearing proper identification. Take your pet to the veterinarian regularly. Know what it takes to be a responsible pet owner.